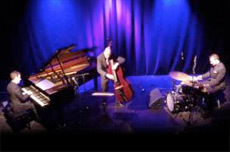 Pianist Matthew Fries, bassist Phil Palombi and drummer Keith Hall first came together as the accompanying trio for singer Curtis Stigers. In 2003 they formed the co-op trio Tri-Fi. They have since been part of the movement to invigorate and revitalize the jazz piano trio. For their third CD, Tri-Fi performs seven Fries originals plus one apiece by Palombi and Hall. But while an individual may have been responsible for each composition, the performances are very much by a three-way democracy. The opening “Clipped Wings” is a thoughtful piece that is as significant for the creative bass lines as it is for the piano playing. Even during the other selections where Fries is clearly in the lead, such as the uptempo romp “Take What You Want But Don’t Touch My Herring Shoes” and the complex but hard-swinging “Repercussions,” Palombi and Hall consistently play stimulating ideas that spontaneously inspire Fries. More important than the individual selections is the general sound of the trio and their telepathic interplay. Tri-Fi has succeeded at both developing its own musical personality and creating music that can only come from a group of like-minded musicians. Three offers listeners a very good sampling of Tri-Fi’s music.